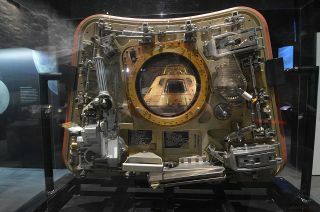 “Columbia,” the Apollo 11 command module, is viewed through the window of its crew hatch as exhibited from the Smithsonian exhibition”Destination Moon: The Apollo 11 Mission” currently in The Museum of Flight in Seattle for its airport 50th anniversary. SEATTLE — Fifty years after splashing down in the Pacific Ocean, the spacecraft that completed the first astronauts to land on the moon has returned to the United States’ west coast. “Columbia,” the Apollo 11 control module which flew Neil Armstrong, Buzz Aldrin and Michael Collins to and by the moon in July 1969, will spend the 50th anniversary of its own assignment in the Museum of Flight at Seattle. The capsule is now the star of the Smithsonian Institution Traveling Exhibition Service’s”Destination Moon: The Apollo 11 Mission,” which opens Saturday (April 13) through Sept. 2 at the Washington state museum. The Museum of Flight has expanded the Smithsonian’s Destination Moon exhibition to emphasize the functions which Washingtonians and regional businesses played in making the very first moon landing potential. Formerly on display in Houston, St. Louis and Pittsburgh, the Destination Moon exhibit was that the Smithsonian’s response about the best way best to keep Columbia on public opinion through the 50th anniversary of this Apollo 11 assignment as its permanent residence, the National Air and Space Museum in Washington, DC, experiences an broad, long-term renovation. Besides the command module, the exhibit features 20 artifacts from the first moon landing mission, such as the helmet and gloves visor assembly which Aldrin wore on the lunar surface. In The Museum of Flight, Columbia is displayed within the former location of this museum’s “Apollo” display, which culminated in 2017. The museum eliminated a few of the previous display’s artifacts out to make way for Destination Moon, including a test control module, but augmented the objects of the Smithsonian with pieces of its \collection. Apollo 11 artifacts on display below a mockup of an Apollo lunar module’s ascent point in Destination Moon at the Museum of Flight in Seattle. Visitors can still view a complete Saturn V F-1 rocket engine as well as the components from search motors which were recovered off the seafloor, as have been formerly a part of the Apollo gallery, but can now also find an F-1 injector plate which helped launch the Apollo 11 assignment as is a portion of their Destination Moon touring exhibition. Along with incorporating some of its own Apollo artifacts, The Museum of Flight has additionally used Destination Moon to emphasize the Seattle region’s role in creating the lunar landing potential. To this end, the enlarged exhibition comprises a version of the lunar rover as was designed by The Boeing Company in nearby Kent, examples of the thrusters designed and built by Redmond-based Aerojet Rocketdyne and memorabilia from the 1962 World’s Fair, which included the debut of the now iconic Space Needle in Seattle. The Apollo 11 command module”Columbia” as noticed at Destination Moon: The Apollo 11 Mission in The Museum of Flight in Seattle. In conjunction with Destination Moon, heaps of Seattle businesses, restaurantsand attractions and organizations are planning to give space-themed products, special promotions and events observing the 50th anniversary of the moon landing below the banner of”Seattle’s Summer’s Space.” The Museum of Flight has additionally re-themed its own children’s play area since”Tranquility Base,” with kid-friendly mockups of their Apollo spacecraft and artwork featuring Snoopy, the Peanuts comic strip puppy , since the very first beagle on the moon. “All around the nation at the moment, there are Apollo celebrations going on. It is going to be a big deal and you’re likely to feel the momentum build. And at these openings, in those exhibitions and celebrations, there are going to be people like me who can’t start off their speech with’I remember where I was on July 20, 1969,'” explained Matt Hayes, president and CEO of The Museum of Flight, who had been born in 1970. Proceed to collectSPACE for additional photographs of Destination Moon: The Apollo 11 Mission at The Museum of Flight in Seattle. Have a news suggestion, correction or comment? Tell us at community@space.com.